On January 1, 2016 a ban on the use of Styrofoam containers went into effect in the city of Washington, DC. This new law will prohibit restaurants and local business from using single use Styrofoam (technically sp eaking, expanded polystyrene foam products) containers to package food and drinks, typically used for take-out orders or to take home leftovers. According to one estimate in a private blog, there are similar bans in effect in more than 70 cities including New York, Minneapolis, San Francisco, Portland and Seattle. In New York City alone, 28,500 tons of expanded Styrofoam was collected in 2012. About 90% of this material was from food and drink related containers. I couldn’t help but smile when I read this story as a remembered back in the late 1980s when CHEJ (then CCHW) kicked off a national campaign against McDonald’s to get the mega food giant to stop using Styrofoam clam shells for all its food packaging. We called this the “McToxics Campaign” and groups all over the country participated including grassroots environmental health activists, students, churches, annual rights activists and advocates of healthy food. These groups, individually and in coalition, picketed local restaurants, fought for local ordinances banning Styrofoam, launched boycotts and engaged in send-it-back campaigns to send the message to McDonalds that they wanted the company to be a corporate leader for positive change, rather than a symbol of our throw-away society. And it worked! After a little over 3 years, McDonalds caved in, marking one of the biggest victories of the grassroots environmental health movement. On November 1, 1990, McDonalds’ announced it would end nearly all Styrofoam packaging use in U.S. restaurants within 60 days. As anticipated, when McDonalds made its announcement, other companies would follow its lead. Jack-In-the-Box followed suit almost immediately, and soon most other fast food restaurants also stopped using Styrofoam. Although many small restaurants and local businesses continued to use Styrofoam, the message continues to grow that this toxic plastic has no place in our society. The many toxic substances generated and released during production, the formation of toxic chemicals when it is burned and the difficulties in recycling and disposal of this material is what drove this campaign and continue to be an issue today as restaurants and businesses search for options to deliver food and drinks. Fortunately there are better options and better alternatives that don’t cause the public health and environmental risks that this plastic does. Cheers to the growing list of cities, towns and municipalities that are deciding one jurisdiction at a time, to move away from this toxic plastic. May there be many more in the coming years. Within minutes of the immense chemical explosions that sent apocalyptic fireballs into the night sky over Tianjin, Zhou Haisen, 23, was making arrangements to leave town. He was terrified that poisonous gases would reach his apartment six miles from the scene, and his fears were swiftly reinforced by posts on Chinese social media. So he and his parents fled to his grandmother’s house an hour’s drive away. Read the full story in the New York Times . AUSTIN, Texas — On July 1, activists gathered at dollar stores nationally to declare their “independence” from toxic chemicals, after a report earlier this year suggested products sold by these discount chains could be hurting consumers. To produce the report, issued in February by Environmental Justice for All’s Campaign for Healthier Solutions, researchers tested 164 products from multiple discount chain stores nationwide and found that 133 contained “at least one hazardous chemical above levels of concern,” meaning that 81% of tested products were hazardous. These include chemicals identified to be carcinogenic, capable of causing developmental disabilities in children, or were otherwise found at levels considered toxic. Unlike major chains like Wal-Mart and Target, no major dollar store chain has a formal policy on selling or disclosing toxic ingredients in products. Tags: cancer, children's health, economic justice, Environmental Justice, plastics | Be Safe, CEHP, Homepage, News, PVC | Permalink | Comments Off | Posted July 10, 2015 by Sharon H.
You’ve probably heard of bisphenol A, or BPA, a synthetic estrogen found in the linings of many food cans. One of the nastiest endocrine disruptors on the market, BPA has been linked to a variety of serious disorders, including cancer, reproductive damage and heart disease. But I bet you haven’t heard this: Consumers have NO reliable way of knowing which canned foods use BPA-based epoxy in their linings. Crazy, right? 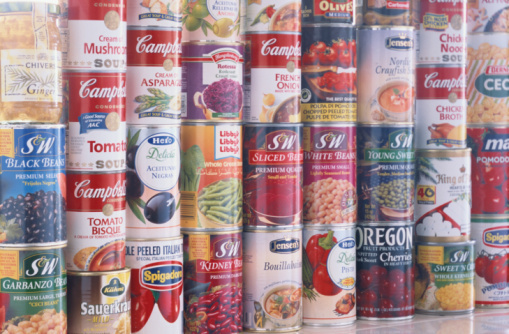 At EWG, we thought so too, which is why we’re proud to release our latest analysis, BPA in Canned Food: Behind the Brand Curtain. We developed this report to help consumers like you determine which products contain BPA and which brands you can count on for BPA-free products. Click here to check out the full report and get the facts on which canned food products still contain BPA. After scrutinizing more than 250 brands of canned food, EWG analysts found that while many companies have publicly pledged to stop using BPA in their cans, more than 110 brands still line all or some of their metal cans with an epoxy resin containing BPA. EWG divides the brands into four categories: those using cans with BPA, those using BPA-free cans for some products, those always using BPA-free cans and those that are unclear. That way, you can tell exactly which products to seek out and which to avoid. Federal regulations don’t require manufacturers to label their products so you can identify cans with BPA-based linings. That’s why EWG stepped up to do this research — so you have the resources you need to avoid BPA and shop smarter. Click here to learn more and see which canned food brands you should avoid and which ones you can count on for BPA-free products. While you can’t yet rely on federal regulations to safeguard you and your family from toxic chemicals like BPA, you can always depend on EWG. Thanks for making this work possible. Tags: bisphenol A, BPA, canned goods, environmental working group, product safety | Be Safe, CEHP, Homepage, News, PVC | Permalink | Comments Off | Posted June 12, 2015 by Sharon H.
Mind the Store has achieved tremendous victories lately – the nation’s two largest home improvement retailers, Home Depot and Lowe’s, have committed to phasing out toxic phthalates in flooring by the end of the year. We’re now turning our attention to Menards, the 3rd largest home improvement chain in the country with sales of over $8 billion and 280 stores in 14 states. You may not have a Menards in your area, that is ok. We still need you to act. If Home Depot and Lowe’s can ban phthalates in flooring, so can Menards! TAKE ACTION: Tell Menards to phase out toxic phthalates in flooring. Testing has found some vinyl flooring Menards sells contains toxic phthalates, chemicals linked to asthma and birth defects in baby boys. Chemicals that are so toxic, they have been restricted in children’s toys. Let’s turn up the heat on Menards— Take action today! Tags: children's health, endocrine disruptors, Menards, Plastic, pthalates, vinyl flooring | Be Safe, CEHP, Homepage, News, PVC | Permalink | Comments Off | Posted May 23, 2015 by Sharon H.
Our water may be contaminated by hormone-disrupting pollutants. Scientists have discovered that harmful concentrations of Bisphenol-A (BPA) may have been deposited directly into rivers and streams by municipal or industrial wastewater. Tags: BPA, hormone disruptors, industrial pollution, toxic pollutants, water pollution, waterways | Be Safe, Homepage, News, PVC | Permalink | Comments Off | Posted May 21, 2015 by Sharon H.
Over the last two weeks we have achieved tremendous victories – the nation’s two largest home improvement retailers, Home Depot and Lowe’s, have committed to phase out toxic phthalates in flooring by the end of the year. This is HUGE as together they sell billions of dollars worth of flooring a year! This is a lot to celebrate, but we’re not stopping there. We’re now turning our attention to Menards, the 3rd largest home improvement chain in the country with sales of over $8 billion and 280 stores in 14 states. If Home Depot and Lowe’s can ban phthalates in flooring, so can Menards! Testing has found some vinyl flooring Menards sells contains toxic phthalates, chemicals linked to asthma and birth defects in baby boys. Chemicals that are so toxic they have been restricted in children’s toys. This may not be easy. Menards has earned a reputation for violating environmental laws in their own home state of Wisconsin. The were fined $1.5 million after their CEO, John Menard Jr. ”used his own pickup truck to haul bags of chromium-contaminated incinerator ash produced by the company and dump it into his trash at home.”1 That’s who we’re up against. Help us turn up the heat on Menards and leverage the victories we’ve achieved to date. Take action today! PS — Help us continue the momentum by calling on the nation’s #3 home improvement chain Menards to ban toxic phthalates in flooring! Tags: flooring, Menards, pthalates, Safer Chemicals Healthy Families, toxic chemicals | Be Safe, Homepage, News, PVC | Permalink | Comments Off | Posted May 19, 2015 by Sharon H.
The chemical Bisphenol-A goes on the Proposition 65 list this week after a unanimous vote by a state scientific panel concluded the element is harmful to women’s reproductive health, according to the California Office of Environmental Health Hazard Assessment. Tags: BPA, endocrine disruptor, Plastic, regulation, reproductive health | Be Safe, Homepage, News, PVC | Permalink | Comments Off | Posted May 15, 2015 by Sharon H.